Be the first to share your favorite memory, photo or story of Alec. This memorial page is dedicated for family, friends and future generations to celebrate the life of their loved one. 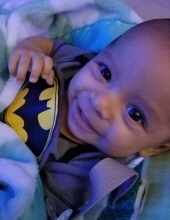 Alec God Lee Rangel, the three month old son of Sienna Metoxen and Alberto Rangel, passed away unexpectedly at home on March 23, 2019. He was born December 23, 2018 in Green Bay. Alec was born a month early, and was a fighter from the start. He was a playful little baby and always swinging his hands around. When it was time to go somewhere, he always had the biggest smile. Alec loved to coo and always tried talking with the grown-ups. He is survived by his parents, Alberto and Sienna; grandparents Lonnie Metoxen, Jolene Walking Eagle; as well as aunts and uncles Shadia, Brandi, Raeden, Kaiden and Tru Metoxen. Alec is further survived by great-grandparents Florence, Yogi, Elaine, Bruce; great-great-grandmother Shirley, as well as numerous great aunts and uncle and other extended family members. He was preceded in death by his great-grandmother Delilah Medera, uncle Kordel Metoxen, great uncle Timmy Metoxen, great aunts Tammy and Trina Villegas, as well as other members of the extended family. Family and friends may visit at Ryan Funeral Home, 305 N. Tenth Street, De Pere, beginning at 10:00 a.m. on Friday, March 29, 2019. A prayer service will take place at 11:00 a.m. with burial to follow at Holy Apostles Cemetery, Freedom Road, Oneida. To send flowers or a remembrance gift to the family of Alec Rangel, please visit our Tribute Store. "Email Address" would like to share the life celebration of Alec Rangel. Click on the "link" to go to share a favorite memory or leave a condolence message for the family.